On a cool and windy day November 11th, 2018 Veterans Day was observed and followed by the dedication of the new Vietnam Veterans Memorial. A Large crowd turned out for both ceremonies and the program was started with bag pipes playing as the crowd was making its way to the ceremony. On the 11th Month, 11 Day at the 11th Hour, all the bells in the city of Beverly Churches rang out in honor of this day. hen it was uncovered there was an applauded from all in attendance. The sculpture had everyone trying to get pictures and groups gathered to take group pictures for more than 20 minutes. This Bronze sculpture is the only bronze sculpture in the City of Beverly. The sculpture was designed by Jane DeDecker of Loveland Colorado, who was chosen from all the entries that came from all over the United State. 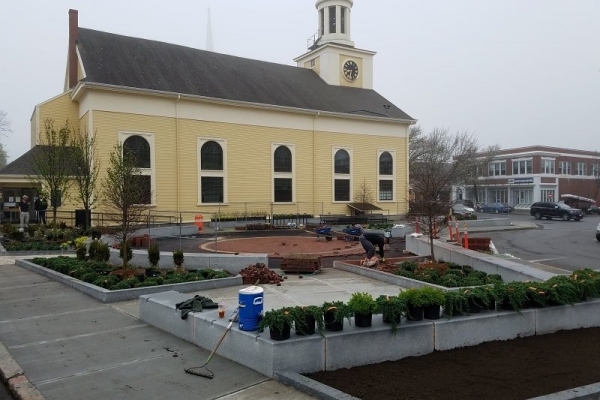 Please come on out and take a look at this inspiring park located here in Beverly at Ellis Square.